From sparkling cover letters to six-word bios, a fresh bevy of job search letters has grown powerfully useful for successful career communications. 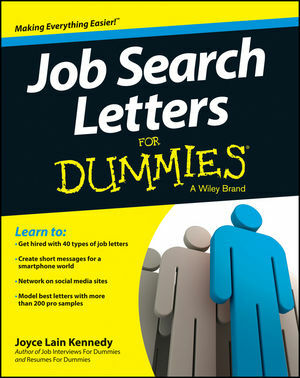 Job Search Letters For Dummies delivers the quality of New Era know-how you need right now to land good jobs and thrive. Whether you’re a long-time professional or a recent college graduate — or somewhere in between — Job Search Letters For Dummies has you covered. Job Search Letters For Dummies covers the gamut of leading-edge topics, including effective strategies for internal career communications on topics such as raises, promotions, and position changes; rules for communicating professionally with texts and networking on social media platforms such as twitter and LinkedIn; fresh and updated communication phrases to voice accomplishments and make job-fit statements; post-interview etiquette and letters such as thank-yous, "hire me" reinforcement notes, interest revival queries; and much more. Whether you’re a long-time professional or a recent college graduate — or somewhere in between — Job Search Letters For Dummies has you covered. Welcome aboard, job seekers! Thanks for checking out this first guide to communications-supported job search and career growth in relentlessly changing technological times. The right messaging — what you say, why you say it, and when you say it — is as important today to your employment goals as it has been at any time since Leonardo da Vinci wrote the first professional resume in 1482. In 1986 fax machines and postal mail were the most popular ways to send resumes and cover letters. In the 1990s the Internet boom kicked in with new tools to connect jobs and people: e-mail, websites, cell phones, mailing lists, and online bulletin boards. In the 21st century the double-time march of recruiting technology skyrocketed, building a techno-swamp populated with endless ideas of how to connect work and people through smartphones, wonder tablets, apps, and social media for virtual networking. You’re competing in a new world of work out there. If your job search is treading water — or even drowning— there’s a better way. Make a splash! Engage hiring authorities through a communications-centered campaign with smart content. Joyce Lain Kennedy is a nationally syndicated careers columnist. Her column, CAREERS NOW, appears twice weekly in newspapers and on websites across the U.S. Kennedy is the author of seven career books, including the award-winning Job Interviews For Dummies and Resumes For Dummies.